Some recent sightings of Flash history around the web. 4thletter!’s 4×4 Elements series looks at what made “Blitz” work. Two more Flash moments appear in Comics Should Be Good’s list of 75 Memorable Moments in DC History: Barry Allen’s sacrifice in Crisis on Infinite Earths and the first Superman/Flash race. Bleeding Cool noticed a similarity between the universe-changing conclusion of Spider-Man’s “One More Day” and a story point in Flash’s “Hell to Pay,” and asked, “Where was the outrage when Wally West did the same thing?” Hmm, on one hand you have someone who makes a deal with the devil to retcon away 15 20 years of stories and create a new status quo that has lasted three years so far. On the other hand, you have someone who makes a deal with the devil for the sake of a story, and he finds a way to beat the Devil at his own game the next issue. Yeah, they’re totally the same. Random Happenstance’s series on 1999’s JLApe event continues with a summary of the Flash installment, featuring Max Monkey and Chimpulse. The Hooded Utilitarian, after reading Flash: Rebirth, decides to go back and read some Silver-Age Flash starting with Showcase #4. This entry was posted in Flash History, Round-Ups and tagged Barry Allen, Blitz, Crisis on Infinite Earths, CSBG Cool Comics, Dark Flash, Gorilla Grodd, Hell to Pay, JLApe, Linkblogging, Neron, Silver Age, Spider-Man, Superman on July 31, 2010 by Kelson. I’ve been really enjoying the ongoing Flash series despite the frustration and disappointment of Flash: Rebirth. It’s as if “The Dastardly Death of the Rogues” is being written by Geoff Johns, and Flash: Rebirth was written by the mirror Geoff. Or in a multiverse context, the Geoff Johns of Earth-3. Also surprising: Johns seems to have remembered an old saying about writing comic books: Every issue is somebody’s first. A few deftly placed lines of dialogue spell out the key details of the story so far: Boomerang’s status and new abilities, who the Renegades are, what file is missing and why, etc. Considering this is part 4 of a 6-part story, I suspect most writers today wouldn’t have bothered. I’m neutral on the “Flash Facts” pages, though if they’re going to keep using them to spotlight the villains, I like the way they link the real tech with the comic-book tech. Last month it was “How Boomerangs Work” and “How Captain Boomerang’s Boomerangs Work.” This month it’s mirrors and Mirror Master’s mirrors. Some of the luster is beginning to fade, though. The structure is starting to feel formulaic: Barry Allen keeps fighting the Renegades, and every battle gets cut short one way or another. Every issue has a major super-speed feat, which individually manages to be extremely cool, but gets repetitive four issues on. I think the main thing that disappointed me about this issue was the revelation behind the murder mystery. Sure, it’s one of the few explanations that fits Barry Allen’s character, but it also violates the expectations set up in the first half of the story. To say any more, I’ll have to break into…. This entry was posted in Reviews and tagged Barry Allen, Brian Buccellato, Brightest Day, Captain Boomerang, Dastardly Death of the Rogues, Francis Manapul, Geoff Johns, Relaunch, Renegades, Rogues on July 29, 2010 by Kelson. 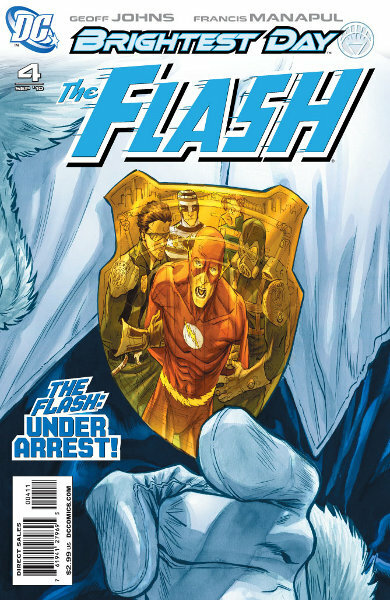 I’m still working on my review of The Flash #4, and hope to have it ready by tonight. In the meantime, you may want to check out this Flickr gallery of Flash costumes at Comic-Con (photos taken by other people), or my Thursday Con Report. This entry was posted in Fun, Round-Ups and tagged Linkblogging, SDCC, SDCC 2010 on July 29, 2010 by Kelson. After the madness of Comic-Con International, it’s time to get back to what that convention is all about: comics! And this Wednesday, we’ve got a new comic about that super-fast guy in a red suit. The original Captain Boomerang returns as BRIGHTEST DAY continues. Meanwhile, Barry must prove his innocence to the Renegades, cops from the 25th century. Discover what connection they have to the Rogues and what travesties have occurred in the future. DC has posted a 4-page preview at The Source, plus final cover art. This entry was posted in Out This Week and tagged Brightest Day, Captain Boomerang, Dastardly Death of the Rogues, Preview on July 27, 2010 by Kelson. It’s been a crazy week here at Speed Force. To help you keep track of it, here’s an index to all of our Comic-Con coverage, between me covering the show onsite and Devin covering the online news. DC Focus: Geoff Johns (Thursday) live blog. No Ordinary Family (Saturday) features some cool speed effects for Julie Benz’ character. DC plans Flash: Speed Force second ongoing book for next year. SDCC Catch-up – bits that I missed. More window art at Flickr. Four Days of Comic-Con index at K-Squared Ramblings. You can follow Speed Force on Twitter, on Facebook or on Google Buzz. 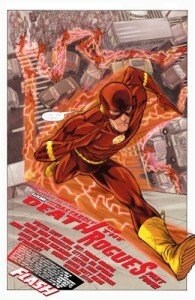 This entry was posted in Flash News and tagged SDCC, SDCC 2010 on July 27, 2010 by Kelson. …along with Orange Lantern Lex Luthor, Indigo Lantern Atom, Black Lanterns Batman, Hawk, Hawkman & Hawkgirl, and Green Lantern Hal Jordan. 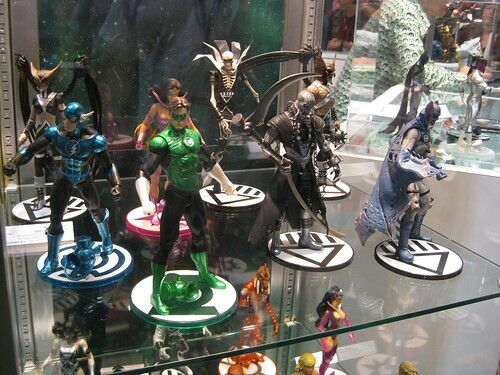 And I think that might be Star Sapphire Wonder Woman behind Hal. 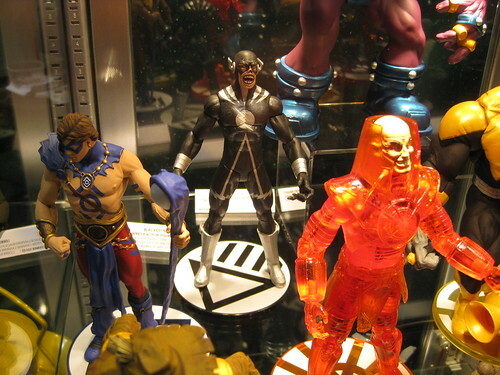 This entry was posted in Collectibles and tagged Action Figures, Black Lantern Reverse Flash, Blackest Night, Blue Lantern Flash, SDCC, SDCC 2010, Toys on July 27, 2010 by Kelson.